Relaxshacks.com: North Carolina HANDS-ON December Workshop w/The Diedricksen Brothers! North Carolina HANDS-ON December Workshop w/The Diedricksen Brothers! 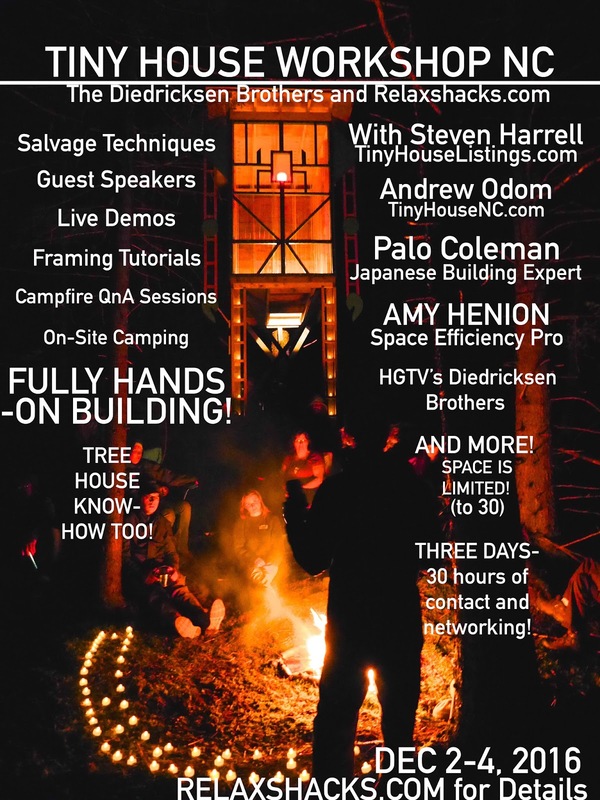 A HANDS-ON BUILDING TINY HOUSE CAMP in NORTH CAROLINA! LIMITED to only 35 students- to keep it more informative, fun, and intimate! Riegelwood, NC- outside of Wilmington..... OFF GRID- we'll have SEVERAL acres of land to build, explore, and camp on! A LIVE PROJECT (you'll actually be building!) in the woods- off-grid. AND we'll shoot a video tour of it for you, for our youtube channel with 110,00 subscribers!